Fireworks are popping and rockets are leaving golden trails hanging in the midnight air. I watch from across the creek here in our quiet and solitary spot the revelers cheering and blowing their party horns. Distant car horns join in and mingle with the laughter that floats by us on this creek off the Intra-coastal Waterway (ICW) in North Carolina. The full moon is etched so crisply against the sky and the panoply of stars so sharp that I know my eyesight has for one moment surpassed 20/20. I go below and Reg is awake long enough for me to kiss him and wish him happy New Year. Back on deck I watch the ice crystals on the sail covers glitter in the 28 degree air. We have been living aboard for 3 months and time has slipped by like so much water under the keel. We have been remiss with our communications over the last few months and will endeavor to fill you in since that last short but excited missive in October. By and large it was a good year, the year we finally cut loose the dock lines and began a new life aboard BlueTopaz. It has been filled with many memorable moments, humor and sadness, triumphs and frustrations. But I believe there isn’t one of us who couldn’t say the same. ​The last three months have given us ample opportunity to learn more patience than we thought possible and encouraged us (sometimes kicking and screaming) to shift our paradigms more than a few times. The move from a land base to a floating one was interesting (I am just getting to the point where I can look back on it and smile instead of cringe, time is a wonderful mediator after all). There are trials and tribulations inherent in any move, especially one in which you go from over 2,000 sq ft to 350 sq ft of living space. ​On October 2, 1998 we moved aboard BlueTopaz, lock, stock and barrel (Reg is looking at me the words “too many barrels” on his lips). 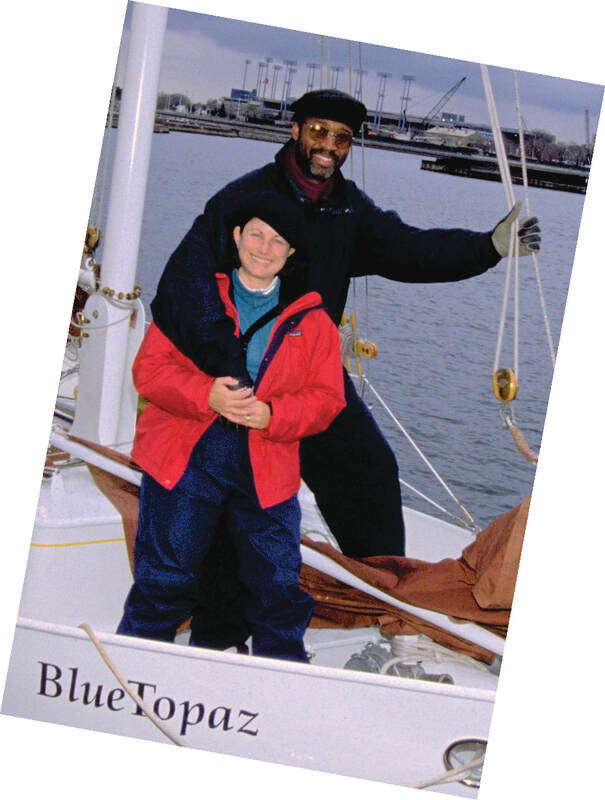 Ten days prior to moving aboard, BlueTopaz was launched. The delay was due to the painters sitting on their thumbs for six months. I believe I had previously reported that many who work on boats, work in another time dimension, somewhere left of the Twilight Zone. Well we got our boat, fortunately she had a good painter (albeit a slow one), she’s beautiful and we were happy and excited to finally be moving aboard. There is a section in my journal (not released yet for public consumption) about An Epiphany A Day. It is about having all these nifty realizations and moments of clarity as we were winding down and closing our businesses, readying ourselves for a new life, etc., etc.,. Well I can tell you the day we moved onto the boat, the epiphanies stopped! ​You know what they say about the best laid plans... All the careful planning about moving onto our boat in an organized fashion, with time to carefully decide where all our equipment and worldly possessions would be stored disappeared with the delayed launching of BlueTopaz. ​On October 1st we were in our house, on October 2nd we had moved everything onto the boat . In those first few weeks friends arrived to finally see our new home and wish us good luck on our journey. The horror that washed across their faces and the speed with which they quickly back pedaled up the companionway steps spoke reams. They came to wish us good luck and left feeling that we were in dire need of more than luck. Later we begged them to come back and witness for themselves that our new lifestyle was truly a sane decision and that chaos did not reign supreme in our lives. I know that those friends of ours who will be sailing away in the next few years were saying to themselves “not us!”. Lesson here: Delay all visitors if you can until life assumes normality. For the benefit of those who didn't experience our move first hand - Imagine this: you have packed up all your worldly belongings you most cherish (minus all those you sold or gave away) and they're safely ensconced in crates in a warehouse. What is left are all those things you absolutely need, all those things you think you need, all those things that you’d like to need but actually you just want. These items represent everything you need to sail to far off places and everything you would like to have in these far off places where accessibility to parts, etc. is limited and you’re leaving for 10-12 years. Now with our fingers firmly crossed we are desperately hoping they will somehow fit into this space which is our new home. Our vessel is 35' long and 10' 7" wide and has tremendous storage capacity. Keep in mind that storage on a boat resembles nothing like storage in your house. Storage on a boat is generally not square, flat bottomed or necessarily conveniently accessed, it does, however, utilize every possible area that isn’t being used for sitting, sleeping, standing, cooking or navigating. I have always marveled at how youthful those who go cruising are. I realize one of their secrets to remaining limber is getting into all of those storage areas on a daily basis. ​Wedged between boxes and bags of stuff it’s difficult to see either end of the boat. Our dog, Nick takes one look and decides the deck or the van is a preferable place to live. Chaos reigns supreme as all bags, boxes, etc. are moved from one side of the boat to the other to free up the particular locker, drawer or bin that is being filled. I’m sure everyone (at least I’d like to think we’re not the only ones to share this first panic) experiences a similar feeling when they look at all their goods and wonder will they ever fit. Twenty years of packing equipment for work on location has given me more optimism than Reg that more can fit into a space than you ever thought imaginable. Although I admit I am guilty of too much optimism and we are still culling and removing items even as of this writing. 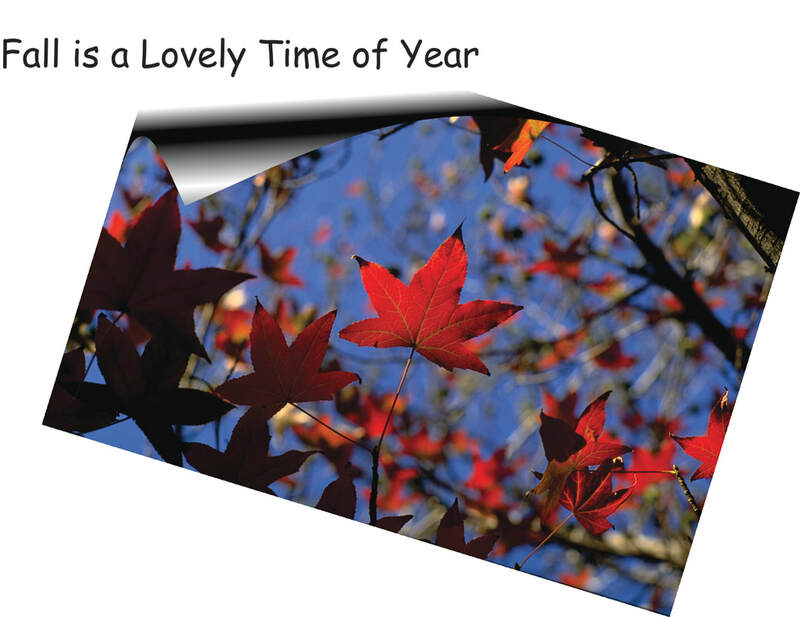 The last warm days are savored and the crisp Fall winds blow with Winter’s whisper. The firebrand colors of the trees, the mustiness of dry leaves crunching underfoot, the cozy scent of fireplaces lingering in the evening air are all aspects of Fall that I cherished knowing that it may be a long time before we experienced this special time of year again. Our view from the deck of BlueTopaz is wonderful. To the East lies the Toronto skyline dominated by the CN Tower. Many mornings we are treated to sunrises of sunlight washing across the Tower amid steel grey clouds with rose tinted underbellies. The golden light of a new day washes over the city and when it reaches our boat we are momentarily warmed in that first rush of sunlight. The chill of the morning quickly reminds us, however, that is Fall and Summer lies only to the South. The downtown Toronto skyline and its accompanying city patter march right to Lake Ontario's edge. To the South of us are the Toronto islands and Lake Ontario, to the West the now quiet water slide of Ontario Place and the CNE (Canadian National Exhibition) stadium lights are visible above the trees. ​To the North a beautiful Maple tree filled park rims the yacht harbor. Parents with buggies, skaters and cyclists wind their way among the changing trees. The trees here in the city lag behind their country cousins in donning their Fall foliage and they continue to turn from Summer’s green to gold and copper, orange and vermillion. This glorious pageant continues for a few weeks thereby postponing the inevitable drabness of the coming Winter. Of course we expect to be long gone before that! ​We enjoy a last party with friends at the Eisens annual boat inspection party. 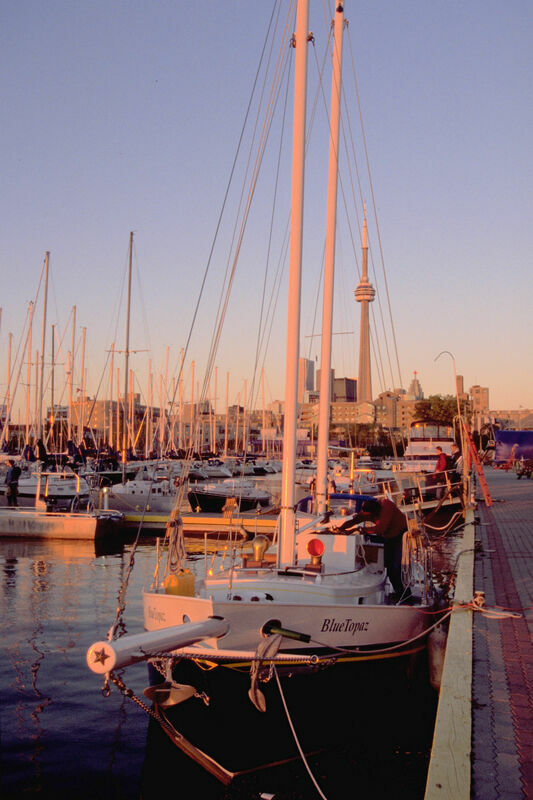 There are several couples who have already begun to cruise and happen to be visiting Toronto as well as those who are completing their boats in anticipation of sailing off in the near future. In the midst of this celebration a cake appears and with surprise we realize it is for us. After seeing so many others on their way I think it is just now beginning to sink in that we are actually on our way! Nick 16 years old, cantankerous as hell, my sidekick for 16 years. A hybrid black Lab (with a little shepherd and terrier thrown in) was a wily, spunky oldster. Women were a sucker for him, he could always con a treat. At 16 he could still muster his puppy look and prance (even if those moments were short lived). We used to joke that Nick (with congestive heart failure) had beaten all the odds and was living on some other doggies time. While Nick wasn’t too sure about his new home, he loved the activity around the yacht club and the extra attention he received on his many walks. ​Around the latter part of October I noticed that every evening we were treated to an entire flock of geese that would be gathered around our boat when Nick and I returned from his evening constitutional. Serenely floating there, they barely moved when we got back onto the boat. They came every evening at sunset and stayed till the following morning. Never had I seen so many geese together here in the yacht basin. Their peaceful presence surrounded BlueTopaz. They stayed for a week and one night they slipped away to a journey already begun. On October 21st Nick left as well. His spirit was willing but his heart wasn’t. We miss him and we were lucky he was with us long enough to be a part of our new home and his photograph has a special place in our salon. ​Halloween, the last truly hot Summer-like day of the year, Nov. 1st and the weather removes any doubt about what lies ahead. . The forest of masts in the yacht basin are gone and the few mastless hulls left at the docks bob up and down quietly awaiting their Winter haul-out. The intense activity of sailors tending to their boats, in preparation for Winter, has dissipated. Casual visitors become fewer. In the middle of this city of 2 million, solitude becomes our companion. We realize that we have been working at a frenetic pace and like a dousing of cold water, Nick’s passing reminds us that we should slow down and enjoy the present even when events don’t meet our expectations. As a result we decide that we will not race the lock closures* and will have the boat trucked South. *The Oswego Canal and the New York State Canal System close November 25th at 5:00PM sharp. During our second month aboard we were lucky enough to experience a real “blow”. The storm arrived one afternoon and built thru the evening to sustained 50-60 knot winds. The winds blew into the yacht basin from its only exposed quadrant, the Southwest. Only 3 boats were in the water and we were the only ones living aboard. 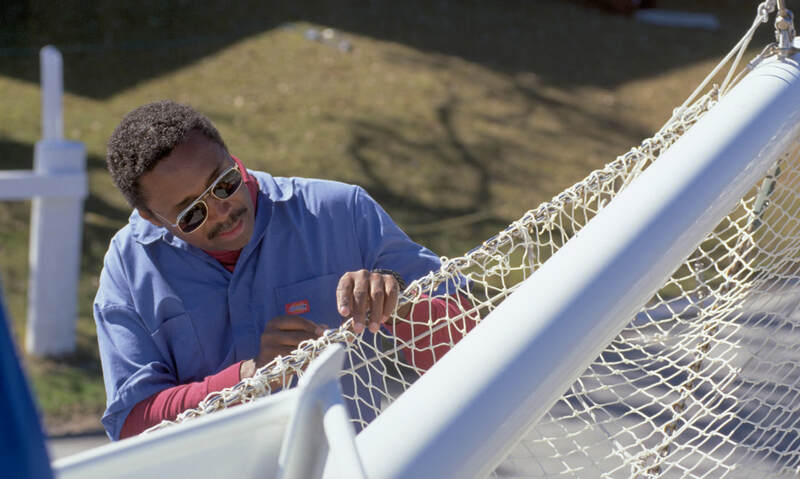 We prepared the boat by stowing everything from the deck that could blow away either below or in the yacht club, the sails were lashed down, extra dock lines (including spring lines running to other docks) were tied on and we thought we were in pretty good shape. Down below we felt safe and secure. The motion from the storm was dampened by BlueTopaz’s weight and low windage. It wasn’t until you went on deck that you realized the severity of the storm. It was quite a sight to see the grey beards crashing through the yacht harbor. The marina was a mix-master of waves, wind and spray. The waves had built to an enormous height and were consistently breaching the breakwater. Thru the night we awoke every twenty minutes or so to check on the dock lines that helped to keep us off the concrete wall we were tied to. It was difficult to keep Reg in sight as he went out to tighten lines. Knowing that the near freezing wind and water whipped over the deserted and slippery (from all the seagull guano) finger docks, I would breathe a sigh of relief when I saw him emerge from the mist. ​Finally We Leave Our Home port! 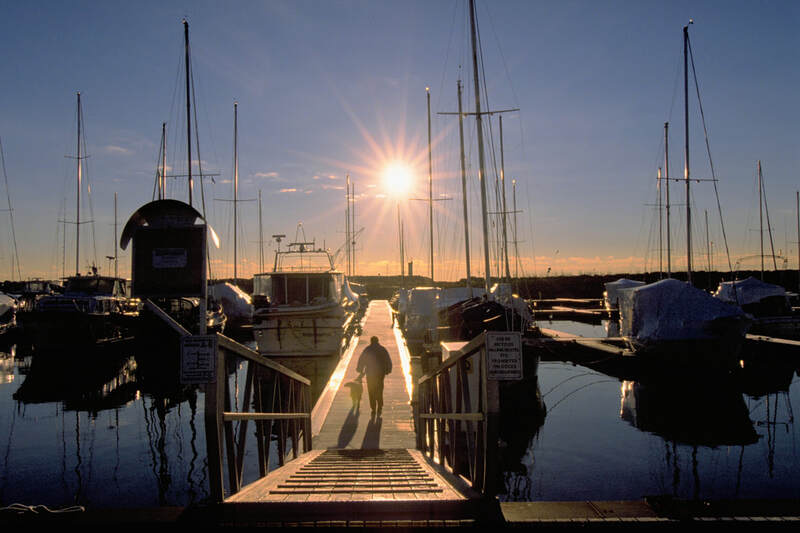 One and half months after moving aboard we motored out of National Yacht Club’s Harbor, the process of pulling the docks for Winter already begun. We were the last boat to sail out of the National Yacht Club. when facing forward) and noticed where the charts indicated 4 feet of water, birds were standing and you could almost see their feet (and we’re not talking cranes here). ​We stayed in the channel and hoped we would make it into the marina. Need I say that we were very happy that BlueTopaz carries a shallow draft (3'8"). Bronte was our home for 10 days, charming at first sight, its charms wore thin rather quickly. 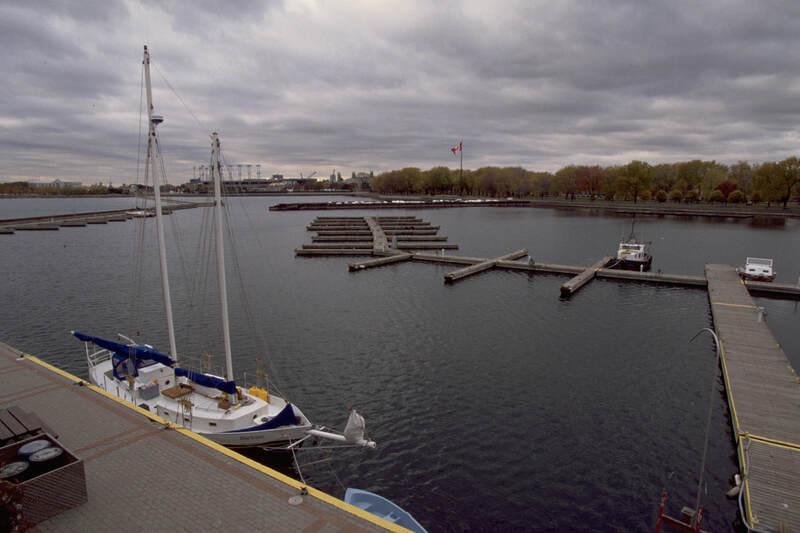 The marina was removing the docks the day we left for the Port Credit Yacht Club. It seems everywhere we went we were one step ahead of the docks being pulled out for the Winter and once again we were the last boat to sail away. E-N-G-I-N-E. Just ask Reg, from mid October until December13th, the engine was repeatedly taken apart and every conceivable test done to try to decipher the mystery of that grey smoke and oil in the water. At one point Reg turned to me and said “Are we chasing ghosts”?. At times it seemed we must be. In the process many items were uncovered that really needed attention and would have otherwise gone un-found. By the time we were done the engine had been taken apart and re-assembled four times, rebuilt once , an on-board fuel filtration system, engine oil drainage system and engine hour meter were installed, and a new exhaust system was designed, fabricated and installed. December 14th Port Credit Yacht Club minus 4 degrees Celsius (22 degrees Fahrenheit), clear crisp, blue skies and a flinty Winter sun. Thick, crunchy frost coats the docks. The seagull tracks proceed my own as I cautiously wander out to the deserted outer docks, squinting against the diamond points of light reflected up from the frost. The seagulls angrily squawk their disapproval of a human presence on what are now clearly their docks. I photograph BlueTopaz in the brittle golden light of morning. Our race to repair the engine before the weather gives out is a victory. Today the engine is declared fit and we prepare to leave the next day. Tomorrow we have a promising weather window of 56 degrees Fahrenheit and 30 mile an hour winds tomorrow and tomorrow only. I glance around at the shrink wrapped live-aboards* and breathe a sigh of relief that we will not be among them. 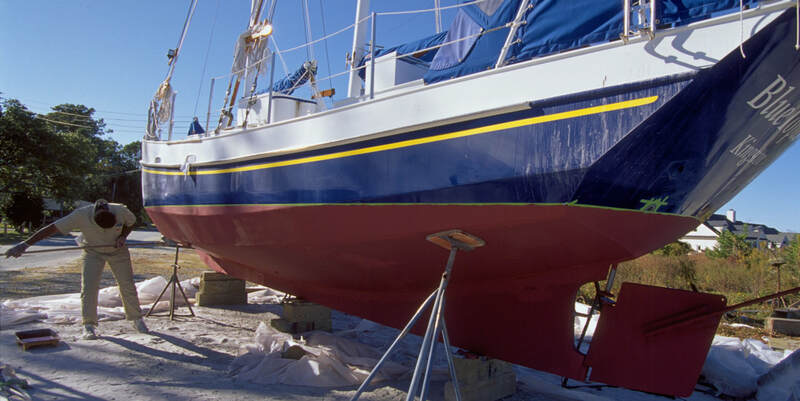 * live-aboards in Ontario prepare for winter in part by building a wooden structure over their topsides and covering it in shrinkwrap. This plastic enclosure ensures that snow and wind are kept off of the deck and all topside structures. The structure acts as a greenhouse as well as a wind break, thereby ensuring a warmer more comfortable environment. I’m sure those who actually live under the shrinkwrap could detail many more of the benefits. We are only too happy not to be able to relate from personal experience the many other benefits that probably exist. 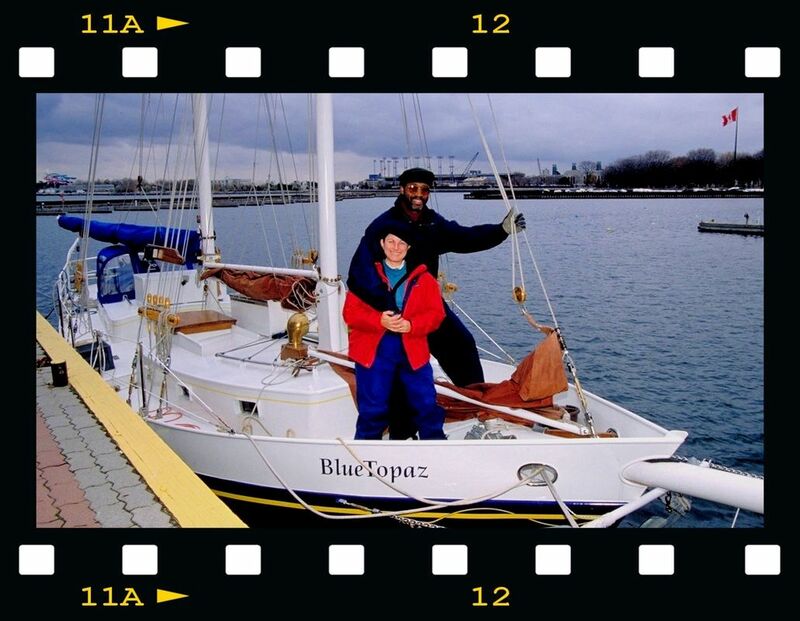 We were the last sail boat (as far as we know ) to sail across Lake Ontario that year. Our crew member for the day, John Eisen, swears that no one believes him when he tells the story. On December 15th the weather was sunny and 13 degrees Celsius (56 degrees Fahrenheit)- on land. Of course on the water with a wind chill factor is another story. Prepared for this temperature discrepancy we dressed for the cold, knowing the wind chill would make it seem colder than it actually was.. I swear it had to be in the 20's and my knees chattered the whole passage (5 hours) to St. Catherines, Ontario (just this side of the Canadian/US border). We were definitely the last boat to be hauled from St. Catherine’s Marina prior to its closing for the Winter. We had 36 hours to de-rig the boat and prep her for hauling South. A final drive to Toronto to drop our crew member, a last dinner with friends, a 1 ½ hour drive back to the boat, 3 hours sleep, then the work began. The masts were taken down and wrapped with bubble wrap, cardboard shielded the masts from the shrouds and attached blocks and all were wrapped again with bubble wrap. In a steady rain, Reg and I worked through the night and removed absolutely everything that wasn’t bolted down from the decks and packed it down below. We went through the boat as if we would be embarking on a stormy passage and prepped and packed so that nothing would shift and/or bang against one another. At 4:00AM we finished packing and drove the van to the entrance of the marina and in the dark, rain beating against our windows, we awaited the truck that would carry BlueTopaz south. Luck is generally more about design than happenstance. But with regards to the weather we feel truly lucky. We moved aboard during one of the warmest, sunniest Fall’s on record and the weather held until the day we left. At 6:00AM on December17th the weather turned. ​In the pre-dawn as the truck hauling BlueTopaz drives out the marina gates, reflected in our headlights are... snowflakes. We took the sun with us and left the North to Winter’s domain! Recently, Reg and I had a good laugh about the fact that we currently have had more pavement under our keel than water. The trip from St. Catherine’s, Ontario to Morehead City, North Carolina is approximately 1200 miles. Our friends, John and Marie Kirnon (BlueTopaz’s Godparents) warned us not o follow our boat down and thus save the anxiety of protective parents. But like the moth drawn to the bug light in “A Bug’s Life”, “we couldn’t help ourselves” and so followed our BlueTopaz south and delightedly and proudly watched the rubber- neckers craning to look at our pride and joy. We cross the border into New York, an inch of snow blankets the upstate countryside. Big, fat snowflakes drift downward persistently The circuitous routing by the New York transportation authorities allows us to have this pastoral rural view. Our driver, Andy, we know is having very different thoughts. 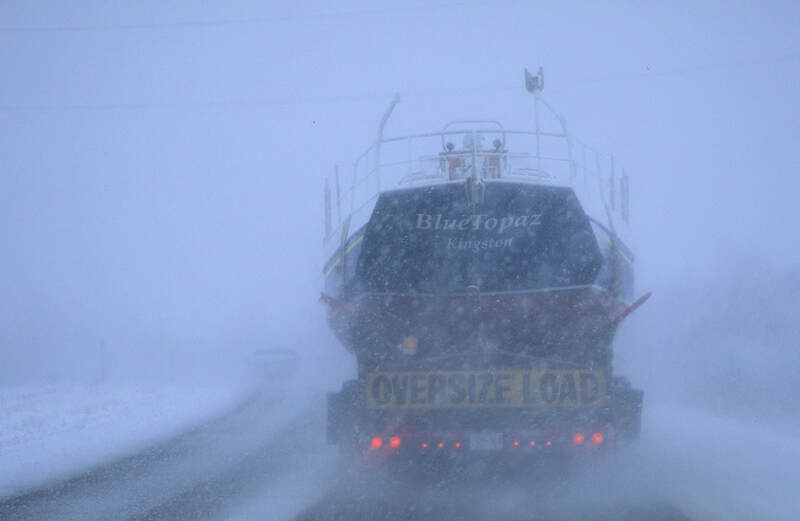 In the process of following the transport we gained a great deal of respect for those truck drivers who haul boats. Andrews Trucking has provided us with Andy, a real gem, a fellow full of nervous energy and absolutely fanatical about protecting our boat. Yep, he’s our kind of guy all right. He hates this route and with good reason. The meandering roads and back country highways may be fine for a leisurely drive but not when you’re driving a truck with a 26,000lb boat. And then, of course, there’s the snowstorm. We keep in touch via cell phone and at one point Andy remarked that he hoped he wouldn’t be pulled over. No sooner said than we turned a corner and there at the intersection in the middle of nowhere New York were ten New York State Troopers. Systematically culling the caravans o​f eighteen wheelers, they signaled our driver to pull over. We hot on his tail, were right there. The trooper strides over to us and says “ I won’t keep your boat long.” Now how did he know who we were-must have been that overanxious parental look. After about half an hour, ticket in hand, Andy walks over, miffed but resigned. Apparently this happens almost every time he comes thru New York. According to Andy, they find something once they pull you over, even if they have to pull from some of the more arcane infractions to do so. Moving the boat to our berth we encounter for the first time - pylons with fixed fingers- no floating docks here. A new docking experience and the impetus for the addition of a rub rail later on. From our berth the narrow entrance off the ICW (Intracoastal Waterway) to Spooners Creek is visible. The narrow entrance widens into the body of the creek where the marina is located, then the creek branches off into two forks where homes and private docks line the shores. 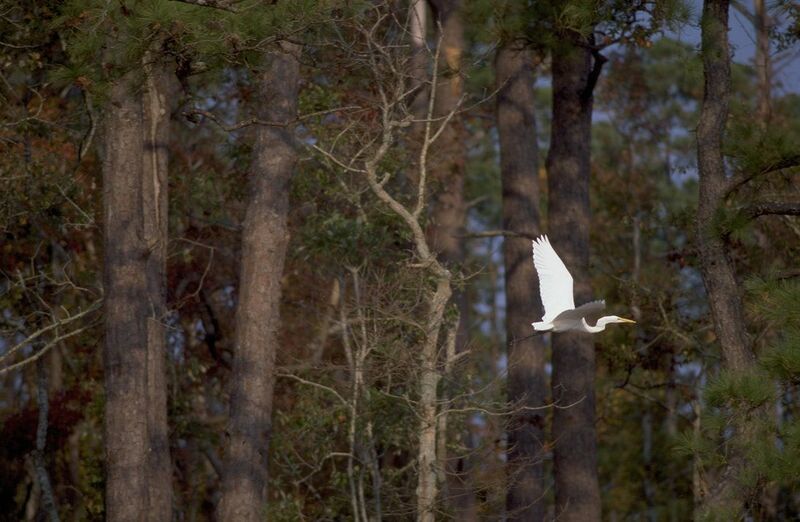 There are large stands of North Carolina Pine along the banks and cranes and other water fowl are seen in the creeks that run through the undeveloped tracks of land. ​There is a narrow spit of land where the Spooners Creek store and office are being constructed and beyond that is the ICW and beyond that are the barrier islands. As it happened the Spooners Creek store and office had burnt down a few months prior to our arrival. They were operating on a very reduced scale in a temporary office but the important things like bathrooms and showers were still operational.. With initial intentions of only staying a few weeks and then moving South, we set to work putting the boat back together and beginning the many boat projects we were unable to start before we left. March 30, 1999, Spooners Creek Yacht Harbor, Morehead City, North Carolina, Sunny and 70. The sun is shining and we are still awaiting sweaty hot tank top weather. For two individuals who swore they weren’t cold weather cruisers, we have certainly tested our limits. We found that we were very comfortable and cozy below decks. In fact for eight months (with the exception of a few meals in the cockpit) we have lived down below. It has been too cold except for working to lounge on deck. We know now that we can be below decks for long periods of time with no problem at all. Something we feel may come in handy on passages when the weather is foul. Off season in a small resort/fishing town allowed us to get to know the communities of Morehead City and Beaufort without all the tourists around. Our busy social schedule involved things like going to the movies, talking with the theater manager and then having the theater all to ourselves. We would sit in the theater and whisper, then realizing we were the only ones there, we would laugh knowing that a normal tone of voice wouldn’t disturb anyone. We explored Fort Macon (a pre Civil War Fort), the Beaufort Maritime Museum and the affiliated wooden boat building and restoration site, the beaches and nature walks. We also became acquainted with almost all the services and stores (especially those involving building and/or marine supplies) sampled almost all the restaurants in town and found the best bargains (dining out, with the exception of the tourist places, is really inexpensive). We met many wonderful people in the course of completing the 60 projects we started since our arrival in Spooners Creek. One of the statements we would often make prior to moving aboard was that we wanted the opportunity to step out of the tourist mode and get to know a community. Of course I don’t think Morehead City was quite what we had in mind, but staying flexible is what it’s all about. By the middle of January with a number of projects on the go and knowing we would be visiting Reg’s mother and uncle in February, we decided that we would stay until April and then explore further south. Once back from our visit we knew that in April I would need to return to Toronto for surgery so we decided to stay put. 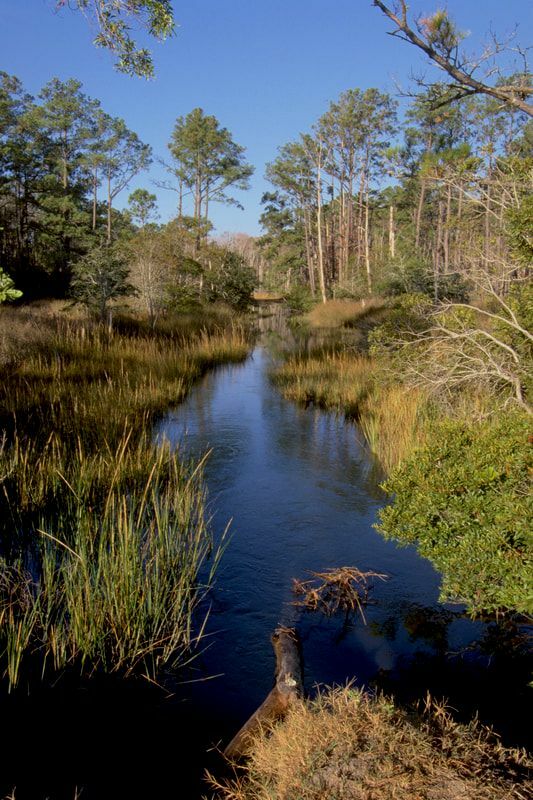 Spooners Creek is a hurricane hole and has proven in many a blow to be a safe harbor. The marina’s tucked away location and the low crime rate for the region were all factorss contributing to our decision to stay put. One of the advantages to being in one place for such a long period and having the van with us, is that we were able to locate craftsmen who could do the work in an excellent and cost effective fashion. Often when sailors arrive in a port they are stuck with whoever is closest and most often they are not the best value for your money. One of the characters we had the pleasure of working with was Hassle Carrol. Hassle is a retired mechanic in his 60's. During the Summer he captains his charter sportfishing boat. During the Winter he follows his other passion- woodworking. We found Hassel through a circuitous route of referrals and with the production of a few belaying pins, Reg and Hassle formed an easy relationship. Hassel went on to help us complete a security drop board for our stateroom, rub rail for the hull and ventilation grids for the quadrant and stateroom clothes locker. Hassle has pretty much spent his whole life in North Carolina, is a church going man and lives to fish. Hassle always brought his little dog with him on every job and the two of them would often share a chew (as in tobacco). ​Honestly, we enjoyed the winter (which was considerably milder than in Toronto) and with much colder temperatures than in Florida the transient sailors were kept to a few in late December and none until the Spring. The activity during the winter at the marina remained very slight. The few live-aboards and 2-3 retired boat owners who would come to work on their boats were virtually the only people around. There were also the marina manager, Lannette and the construction crew. But they were gone early and the creek was left to us. I know that we have often said that we may be sailing to the ends of the earth but we are not sailing off the edge of it. Most of you have probably felt that we did in fact sail over the edge. We were hermits or to put it in the 90's vernacular “we were cocooning”and in retrospect needed the time to center ourselves - to chill out from the insanity of the proceeding six months. 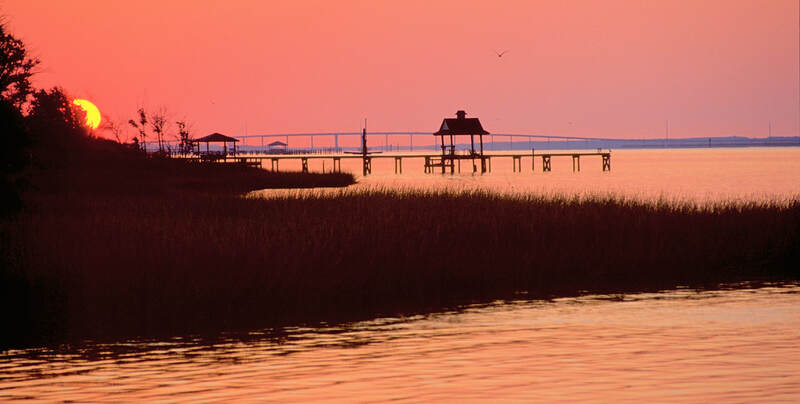 Situated on the southern coast of N. Carolina, Carteret County encompasses almost as much water as it does land. Beaufort and Morehead City, which lie across the river from one another, have the highest population densities in the area totaling about 12 thousand. When you add in the barrier islands you have maybe 16 thousand in permanent population. In the summer the population of the area swells to about 200 thousand. This seasonal population explosion explains the fifteen supermarkets and three multi-screen movie theaters. This area, known also as the Crystal Coast has a history long bound with the sea. Piracy’s most notorious figure, Blackbeard plied his trade off the coast. His flagship the Queen Anne’s Revenge lies in the Atlantic just off Beaufort Inlet. Piracy has, thankfully, found other homes. ​Fishing and boat building have long flourished here. Many of these boats were flat-bottomed spritsail skiffs or sharpies. These boats could sail in shallow waters, carry the family to town or to a picnic on the banks while holding all their gill nets, crab pots, or bushels of oysters. Shad boats with slightly rounded bottoms offered open water stability in the northern sounds. Today, on Harker’s Island traditional boats are still constructed in backyards “by the rack of the eye”. This is an area conditioned to seeing large numbers of transients coming and going throughout the year. 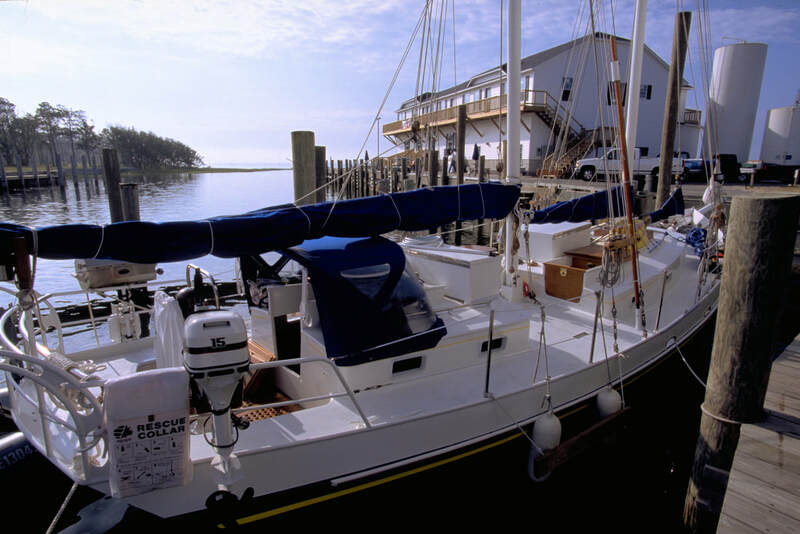 Beaufort, known as the jumping off point for those who want to head offshore to Bermuda or the Caribbean, as well as Morehead City are extremely well equipped with services and supplies for the boating community. The two towns are definitely divided as to the predominant type of boat to be found there. 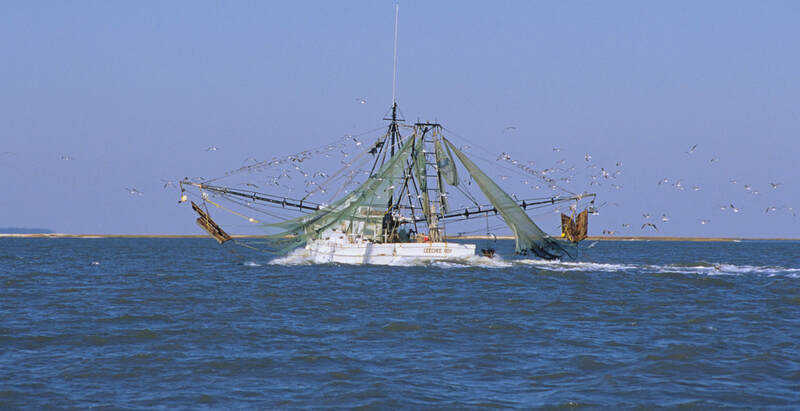 Beaufort is the sailors port and Morehead City is the motor and sportfishing port. Reg and I have never seen so many sportfishing boats in one place as we have in Morehead City. Speaking of civility, Southerners are loathe to come right out and say “no”. For example, Reg orders pecan pancakes in a local eatery, the waitress reads back our order and when she gets to the pancakes, she says to Reg “and you ordered the regular pancakes”. Reg immediately reminds her that he has ordered pecan pancakes. Without blinking an eye she says “yes but we’re out of pecans”. ​There is also the “no thank you helping”. In order not to offend your host or hostess it is polite to accept a small helping of whatever is being offered rather than say “no thank you”. 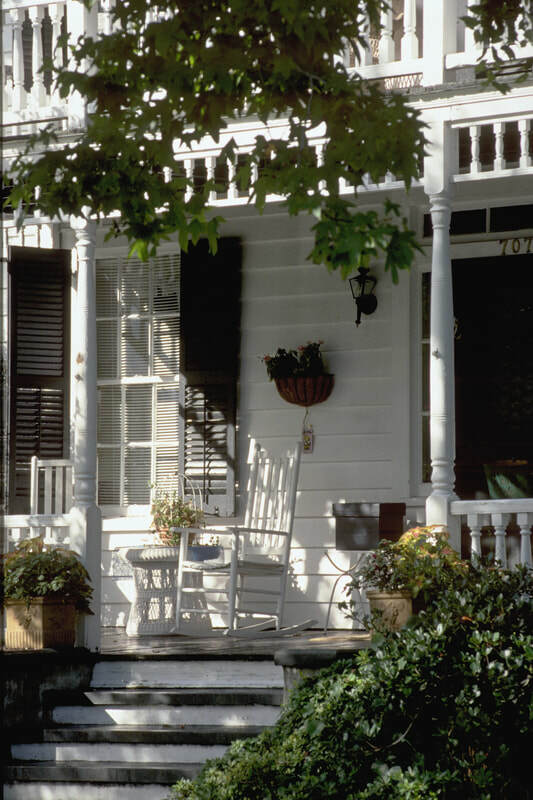 We love the slower pace of life and local amicability which are in evidence whenever we obtain local goods or services. It is the custom to stay and chat awhile after making a purchase, in fact it would be considered quite rude to buy and walk. There is much to be said for politeness and we have made very pleasant acquaintances and enjoyed some good times with many locals. I must say that the closest comradery we have developed is with other “outsiders” like ourselves. Probably not so different from any small town anywhere in the world. One evening a transient sailboat from Oriental, NC (just up the ICW) pulled up and spent the night. Husband and wife, weekend cruisers, at sunset we engage in easy banter boat to boat. The lady of the vessel upon learning our plans, voiced an oft heard query “Won’t you get bored spending all that time on a boat?” I reminded her that of course not every waking hour is spent on our boat. After all traveling is to see the ports of call we visit and time spent on the boat (our home) is very full, with daily activities. June 8th and while it’s not technically Summer yet, the consistent 90 degree heat and high humidity make that a moot point. The water temperature has risen to about 88 degrees. We have been living “on the hard” for the last few days while BlueTopaz was having her water line raised. Upon our return from Toronto we had discovered a virtual forest of grass and barnacles growing on the side of the boat where the bottom paint ended. What a difference six weeks in almost 90 degree water can make. 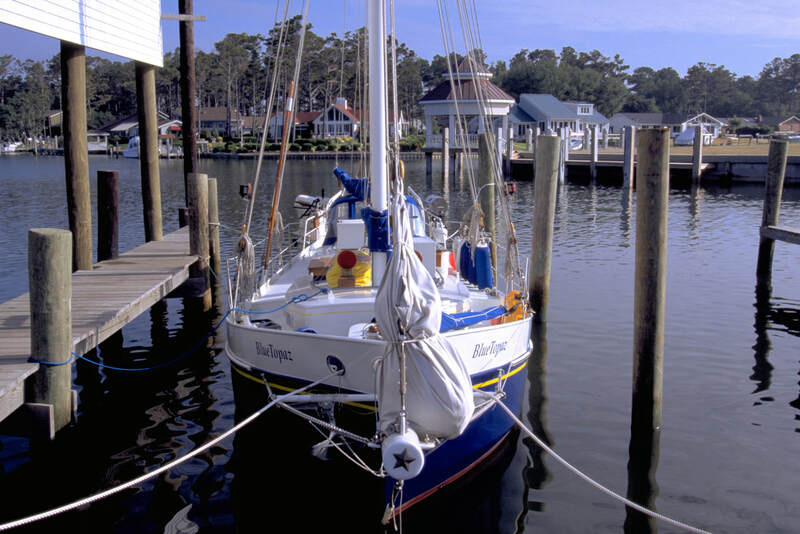 June 8th 11:00 AM and BlueTopaz went back into the water and took her first voyage on the ICW. We wanted to test out the newly pitched prop and give the engine a good run. Wow, was it ever great to be on the water. We are really itching to get moving. We’ve blown up the dinghy, found a place to store our van and are preparing to leave. This weekend we sail North to the Chesapeake for the Summer After six months, Morehead City has grown on us, locals are beginning to treat us more like residents and we will miss those friends we have made. Tonight we enjoy a cockpit dinner with Mars in the South and Venus in the West keeping us company. Our family became a little smaller this year. On April 14th we lost Reg’s Uncle Clarence. He was almost 93 and in true Clarence fashion embraced life to the very end. We will miss his wit and stimulating conversation. He was our passport to a world long gone. His life demonstrated that it is possible to grow old with dignity, integrity and style. ​What is the color and shape and smell of peace and contentment? It is: waking up to sunshine streaming through the portholes, the sound of the wind whistling in the rigging and the rain lashing the deck while we are snug and secure below, it is the smell of fresh baked biscuits hot from the galley, the sight of the cormorant family fishing for their daily meal, the shape of the crane outlined in the moonlight as we eye one another from our perches, it is the disappearance of the calendar and knowing that at the end of the day we can pause for as long as it takes to watch every last bit of the sun drop beneath the horizon.